Following on from my post last week, I have one final project to tell you about, that was created in relation to the Ravellenics. In fact, this project is divided into two, because I spun the yarn before knitting it. 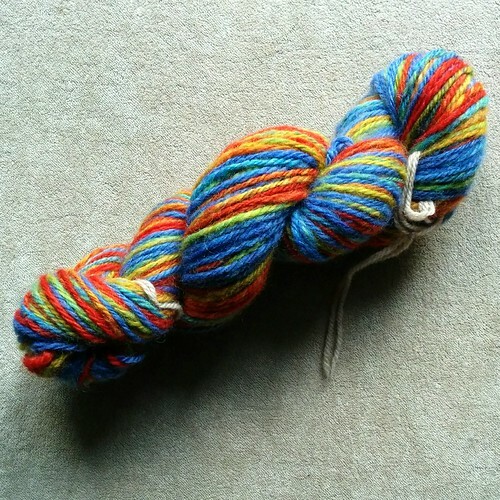 As I was aiming for a rainbow themed Ravellenics, I managed to catch a destash of Babylonglegs Fibre, and the colourway was Rainbow Brite! Babylonglegs no longer dyes fibre so I was delighted to find this Corriedale fibre in the perfect colour. It was a sign, to me anyway, that my real challenge would be to spin and then knit up the handspun. I spun the yarn on my Enid Ashcroft spindle (which I still adore) and produced a reasonably consistent single. I tried to keep it light and airy, though I was spinning worsted style. I am learning finally how to lessen the density of my spun yarn. As the fibre was older, it was quite compacted and I had to sometimes tease out the fibres, but other than that, the spinning was a breeze. I didn't do a sample card (naughty Chrissy) and simply spun my default single. Despite the compacting, the fibre was lofty when spun and there seemed to quite a lot of crimp in the fibres, which helped keep it light and airy. Once the single was finished I decided to create a plying ball with chains included to make it easier to spin. I paid very close attention to where the transitions of colour happened on the chain, choosing whether to make a clean break of colour to allow the colours to blend to create secondary colours. It was the most controlled chain creation I've tried. This, for me, is one of the real advantages of plying balls, you can think about things like chains, without trying to put twist into it at the same time. 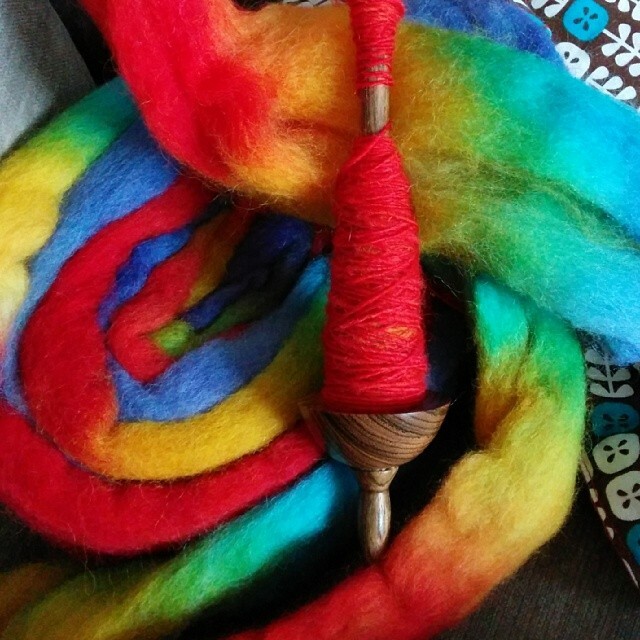 The fibre felt quite coarse as I was spinning it, but after a good soak and thwack it softened up a bit. I was incredibly happy with the results of this spin. 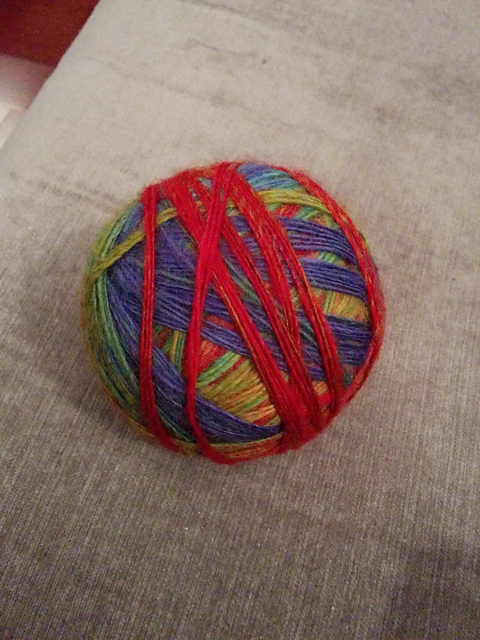 The yarn was pretty consistent and the colour changes were smooth. I got 144m from 110g of fibre. It was a DK/Worsted weight and I knew it would be perfect as a cowl. I wanted to try a shape like Zuzu's Petals, but didn't buy a pattern as I couldn't find one to match my yarn, so I just started knitting. The resulting cowl was not a success. It was so bad that when I tried to find a photo I'd taken to show you, I found I'd deleted it! As I still had some time until the end of the Ravellenics, I decided to frog the project. I loved the yarn too much to let it sit unloved in a horrible failure of a project. Knitting and frogging the project softened up the yarn significantly. 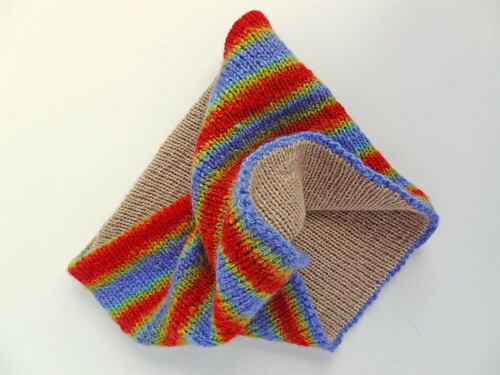 This time I decided to try a straightforward tube style of cowl, as the other shape I'd tried didn't really show off the stripes within the yarn, to it's best advantage. I also decided that despite softening up again, the yarn still wasn't really wear next to skin soft. I decided to knit a liner for the cowl, which would also help with structure and warmth too. I used the yarn left over from the French Cancan shawl and it was a great choice. 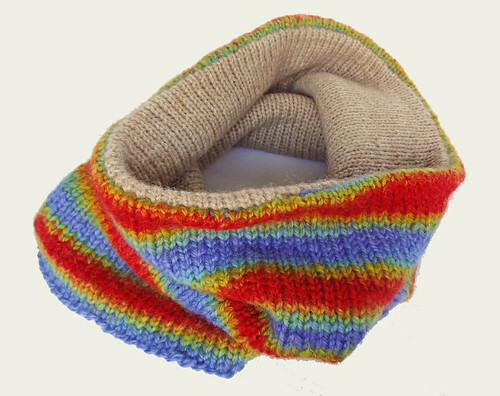 I love this version of a rainbow cowl! I knit the Corriedale outer, in the round, and when I reached the end, I purled a round and then started knitting with Stylecraft Ethical Twist 70/30. This yarn is slightly lighter than the Corriedale I spun, so knew it would sit quite neatly inside the outer, without any need for changes of needle or stitch count. When the liner was the same length as the outer I cast off all the stitches. I then mattress stitched the lining and the outer shell together along the cast on and cast off edges. It made a soft rolled join, whereas the purl row provided a much firmer edge between the outer and liner. This was another occasion when the transformative abilities of blocking can be seen clearly. All the stitches lined up and the liner stitches plumped up to make it flush against the outer shell. As you can see, the chain plying worked brilliantly at keeping the stripes intact. Sadly the spinning process means there aren't that enough colours to make the finished project, a full rainbow one, but the intention was there. I am delighted with my finished cowl. It is very cuddly and soft. It is also tall enough to help cover my ears, one of my most vulnerable areas when out and about in Winter. You can pull the cowl up to nearly cover your whole face! 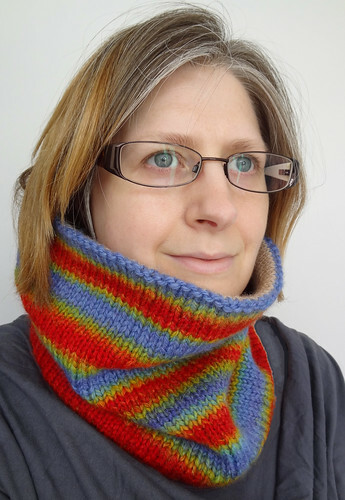 I'm going out to the shop later to test the capabilities of my new cowl, and whether it can keep out the sharp cold wind that bites me at the traffic lights. This was a project that really challenged me. It's the first time I've spun to a deadline. 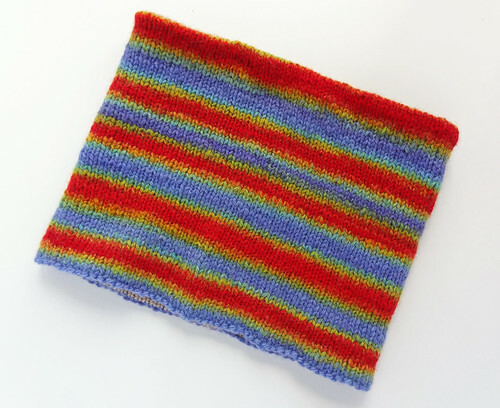 I also kept going on the knitting until I had a cowl that really suited the yarn, and allowed it to shine. This cowl is a showcase for the yarn, and I'm happy with that. However, it is also lovely article of warm and cosy Winter clothing, that represents my hard work in learning to spin this last year. I suppose, in a way, that is what my Ravellenics project was all about. Bringing all my training to bear during the two weeks of the Games to produce a project that was a winner. I may not be able to skeleton down a steep mountain or perform flips off a rail, but I can spin and I can knit and the Ravellenics is my way of paying tribute to all the hard work and training that the athletes carry out in order to represent their country. I'm so proud of Team GB getting four medals. We are not a country where you can do Winter sports, outside of a few areas of Scotland and the snowdomes scattered sparsely through the rest of the country. To have won 4 medals and placed pretty highly in a few more events is a real achievement for our country, and I hope that at the next Winter Olympics we will have many more opportunities to shine. I also hope that the slopes of the snowdomes are full of excited new potential athletes trying out new sports for the first time, as a result of the games. The Winter Olympics is now over, and I'm a little sad because I loved watching it. Of course, starting 7th March, the Winter Paralympics gets under way. I can't wait to watch some of that, I'll have another week of curling to watch!